Print Crazy 8 savings coupon and take an extra 15% off your entire purchase! 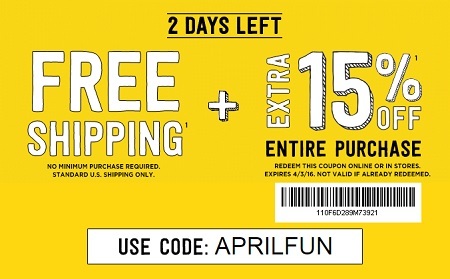 You can also enjoy the offer online with promo code APRILFUN. Only hours left, so hurry up! Free shipping included in the offer. Source of the information is Crazy 8. For more information visit your nearest Crazy 8 store. Offer expires today 04/03/2016.